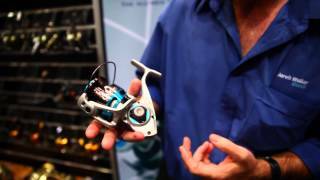 Saltwater anglers seeking the latest spin reel design with the technology to handle extreme fish will appreciate the build quality of our new Quantum Cabo series. The all-new Cabo design builds on a proven saltwater heritage with a modernistic lightweight frame and more metal inside and out than its competition. The body and side cover are built from the new SCR alloy—a material designed in conjunction with marine-engine metal experts—for the ultimate in strength and corrosion resistance. Further protection is added with a SaltGuard 2.0 coating applied to the alloy prior to the painting process. The machined aluminium handle and ported aluminium spool add to the metal count, as does the huge centre shaft, which is complemented by stronger threads. The super-sized water-tight drag includes an impressive stack of ceramic, carbon fibre and stainless steel washers above the spool, with massive ceramic and carbon fibre washers under the spool, for increased drag capacity, excellent heat dissipation and smooth delivery of power under load. Our new Cabo design utilises seven polymer-stainless hybrid PT bearings plus one sealed anti-reverse bearing. Other features include a nickel-titanium bail and magnetic bail trip mechanism that is guaranteed for life. The range comprises four reels. Sizes 40 and 50 have 5.3:1 gear ratios and the big 60 and 80 sizes have a 4.9:1 design. Line capacities range from 270yd of 30lb braid on the 40, up to 380yd of 65lb braid on the Cabo 80. For icing on the cake, the new Cabo spin reels are lubricated with premium Hot Sauce grease and oil at the factory, so they’re ready to perform at their best right out of the box.